Several notable New York public figures made appearances and delighted the crowd at the 2015 event. They ranged from political heavyweights like Governor Andrew Cuomo (pictured below, center), who spoke about a blueprint to end the epidemic in New York by 2020, to Broadway stars such as Tyne Daly and David Hyde-Pierce, who have long been supporters in the fight against HIV/AIDS. The campaign’s iconic I Walk… imagery once again blanketed the city’s streets. This year’s images featured the staff and clients of GMHC in order to further foster a personal connection with supporters throughout the city. 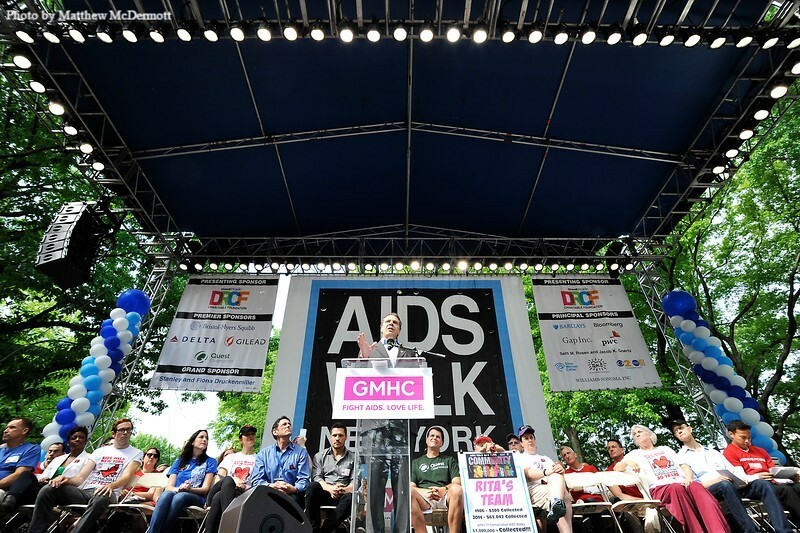 Notably, the GMHC team raised at $242,460, which is more than it ever has during an AIDS Walk campaign. One of AIDS Walk New York’s most celebrated participants, Rita Fischer, also exceeded the $1 million mark in total funds raised since she began walking, a feat she accomplished shortly before her 93rd birthday. In all, the event’s fundraising came in at $4.9 million. Organizers look forward to continuing their longstanding partnership with GMHC. In fact, agreements are already in place to continue producing the event through 2018.